How do you get kids to do chores? If you prepare for battle every time you ask your child to do a chore, fear no more. Here are the 5 common phrases that kids say along with your rebuttal. Look forward to no fighting, no yelling and your child helping more at home. Oh wait… the problem is me, isn’t it? I love my house clean, but I don’t like to do it. When I see my daughter refusing to do her chores, I feel her pain. She reacts to chore requests the exact same way I reacted as a kid. I avoided them. When my parents laid on the pressure, I sulkily got up, stomped to the kitchen (we’re talking dishes here) and did the task to the LEAST of my abilities. I get it. Chores are not fun. However, there are a few goals we as parents have when teaching kids to do chores. #1: They need to clean up the messes they help create. Since my daughter uses the bathroom, she needs to help clean the bathroom. She wears her clothes, she needs to wash them. #2 They need to work for the things they have. Every item we own requires maintenance or cleaning. When we don’t care for it, things fall into disrepair. #3 We are a family and we help each other out. If there is a task that would make something easier for another family member, you need to do it because that family member would do the same for you. If I ask my daughter to start a load of her brother’s clothes, she needs to do it because it takes a job off my plate and it helps her brother. And helping others is a very good thing. When I hear the following excuses or responses, I’m annoyed. I can’t deny it. There are some days when I’m pushed too far (lately by my two-year-old) and I get grumpy. Please know, I am not perfect and no parent needs to be. Believe me, the first thing I want to say is, “Well, I don’t want to wash the dishes” or “I don’t want to mop the floor.” Because those are both true! But it’s unproductive. Instead, go to your child and kneel down to eye level. First, empathize. In a caring tone of voice, which you honestly might have to fake, say something like, “I know that you would rather be playing with your dolls or riding around on your car.” Your kids need to know you care about them and can see the situation from their point of view. If it sounds at all fake, it won’t work. If your child argues further, repeat your exact request again. And again. And again. Keep a calm tone of voice. This usually annoys my daughter. She eventually stops arguing and stomps off to do her chore. She doesn’t need to be happy completing chores, but she does need to do them. This is my two-year-old’s favorite response to my requests lately. He is two and has a few jobs. He sets placemats on the table for dinner and he feeds the dog. We recently switched a few chores around here and now it’s the two-year-old’s job to feed the dog. Dog likes this. As you can see, that chore takes a bit of work for a 2-year-old to master. If your young child refuses to do a chore, walk to them, get down to eye level and offer to help them start the chore. Usually, once I offer to do a chore with my child, they follow. A word of warning here about 2-year-olds and other young kids. Sometimes the fight just isn’t worth it. If your child is protesting a lot and you feel you can’t win, it’s ok to give up. Just try again tomorrow. In my house, just a minute usually means, “I don’t want to do this chore so I’m going to put it off until mom forgets she asked me.” That doesn’t fly. Instead, when my daughter tells me just a minute, I take her at her literal word. I say, “Ok, I’m setting the timer for a minute. When it goes off, it’s time to do your chore. Right?” I wait for a response and then hit that button. Yes, the answer here is always yes. No further explanation needed. I am completely OK with my kids deciding when to do their chores as long as their choice is timely and they actually do it. In fact, giving a choice of when to do a chore actually gives the child more investment in the task because they have a say in the process. Get a firm commitment. Ask “When do you want to do it?” When they tell you and if you agree with the time frame, hold them to it. Some days my kids push me so hard that “Because I said so” is my first reply. However, this can’t be the response because it’s not how I want to raise my kids. I don’t want them to blindly follow authority without question. While it may make my life easier in the short run if they did, I want my kids to think on their own and constantly challenge the status quo. Kids who talk back actually become happier and more successful adults. I can think of tons of times that I have been insulted and have not been able to defend myself or think of a good retort because I was so afraid of standing my ground. Instead of “Because I said so” I need to give my kids the real reason so that they can either understand why they should do it or give me a better reason why they shouldn’t. Sometimes they win, most times I do. When your child asks why, tell them the real reason why the chore has to be done. If they keep repeating “why?”, repeat your same reason and don’t think of a new one. If this doesn’t work, stop talking and give them the “I’m your parent and if you know what’s good for you, GO DO IT” glare. Don’t say that, but communicate that through your eyes. Get it scary enough and it will work every time. 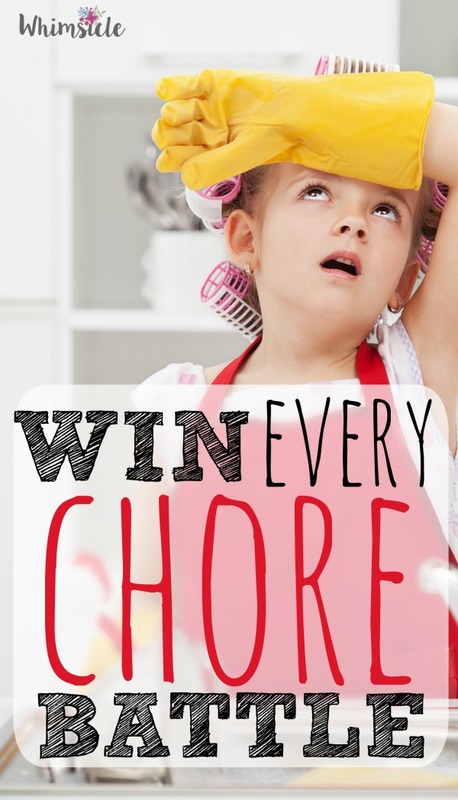 Getting kids to do chores is a constant teaching process. I wish I could simply put up a sticker chart and it would work. But it’s not that easy. Stand your ground and soon you’ll notice less argument and more helping from your children. How do you get kids to do chores? I love these! Thank you for sharing. This is a new thing my daughter is doing. I hate it because she used to be so willing to help!